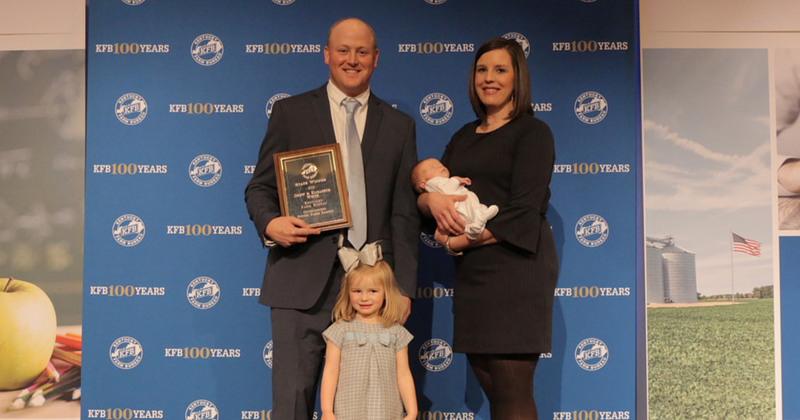 Drew and Liz White of Union County were honored as Kentucky Farm Bureau’s (KFB) “2018 Outstanding Young Farm Family” at the 99th KFB Annual Meeting in Louisville. The award, given yearly, recognizes a couple or individual under 35 that demonstrates the strongest farm management skills, community and KFB involvement, and consistent financial growth through their farm. Drew and Liz White of Union County Accept the 2018 Outstanding Young Farm Family Award with their daughter, Sutton, and son, Abbott. The White family has deep farming roots that started during the Great Depression when Drew’s grandfather began farming with his brothers. Drew worked on his family’s farm his entire life and still works with many members of his family to operate the farm today. In addition to raising cattle and growing hay and straw, major crops on their family’s farm include corn, soybeans, and wheat. Liz also grew up on a family farm. She showed saddlebred horses during her youth and worked at a local farm winery while in high school and college. The Whites are invested in the future of their family’s farming operation. They hope to expand the operation by renting and purchasing more land and by having the ability to hire more employees. Drew and Liz have been involved in various community and agriculture leadership roles over the years, including FFA and 4-H. They enjoy spending time on their farm with their young daughter. Kentucky Farm Bureau, with nearly 500,000 member families statewide, is the state’s largest general farm organization. Approximately 2,000 members attended KFB’s 99th Annual Meeting in Louisville to recognize this year’s individual and organizational achievements and adopt policy for 2019.